Postcards are genuine all-rounders. 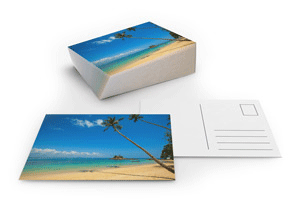 They can be used as save-the-date cards, for sending holiday greetings to friends and family or simply for saying “thanks” to customers or staff. 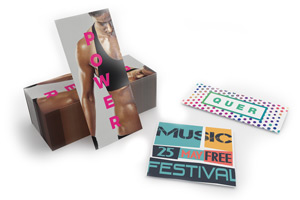 We print them on a wide variety of materials; the front is plastic-laminated while the back can be written on. Now all you have to do is choose your favourite format! There are lots of occasions that call for celebration! Our greeting cards are also excellent for inviting cherished guests to a wedding, birthday party or christening! 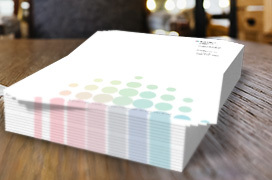 Choose your favourites from a large number of paper weights and formats and design a perfect card just as you please. 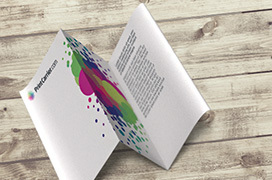 We print greeting cards in full colour on both sides. 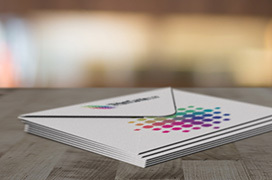 Our self-adhesive postcards add value by turning your holiday greetings into something truly special! 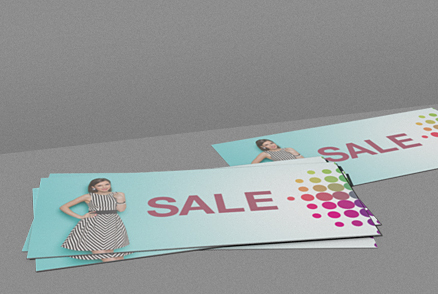 Available in square or round versions on 305gsm self-adhesive paper with cardboard backing, they cut an excellent figure. Unfortunately this product is currently not available due to a supply gap. 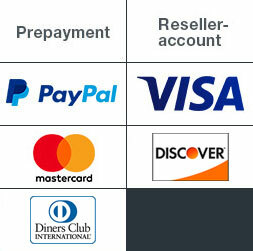 We are working quickly to resolve the situation, so that we can offer you this product as soon as possible. We apologize for any inconvenience this may have caused. Would you like to thank or congratulate your customers? There are different reasons to send such a personal message. 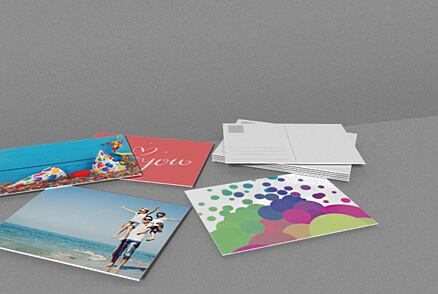 Choose to print postcards, self-adhesive postcards or the printing of greetings-cards. There are plenty of opportunities for both variants. Accompany your letters without further delay with our envelopes or correspondence cards. To leave a lasting impression, 300g is the magic number! With this grammage, your messages are both safe and light enough not to exceed your shipping budget. 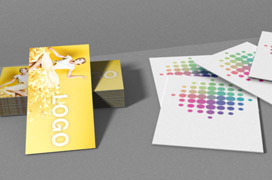 A glossy, coated or matt laminated or soft-touch surface - you decide which card is right for you. Do not send this type of e-mail message to your customers. The postal channel is more personal and creates a basis of trust. There are many opportunities for these messages. For special events such as birthdays, Christmas or Easter, greeting cards are ideal. 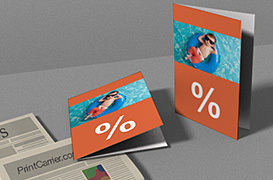 Promotions or special offers can be sent in the form of postcards or greeting cards. What should your card look like? Do you prefer to send colourful messages, which have a rather cheerful and daring effect, or more serious messages in black and white? With us, you have a choice. 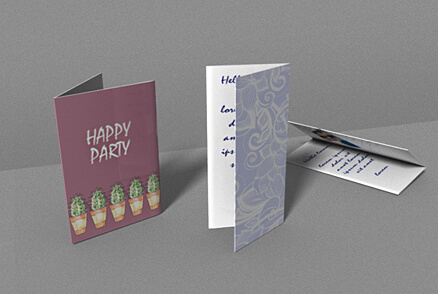 We print your greeting cards either on the front side or according to your individual requirements. 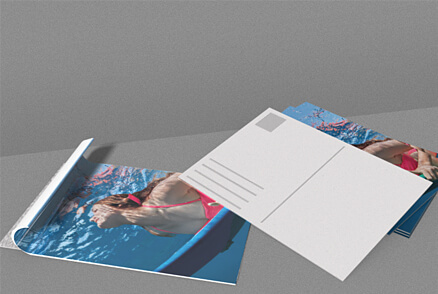 The mail that arrives in your customers' mailbox gives a more individual and personal impression. For him, knowing that the sender knows his address and name creates trust. Clients affected at home, in their familiar surroundings, are then more open-minded. That's why this advertising option offers a smart alternative to remind the customer of your brand and associate a positive experience with it.